What’s in store for Professor Keating? Is the How to Get Away with Murder TV show cancelled or renewed for a sixth season on ABC? 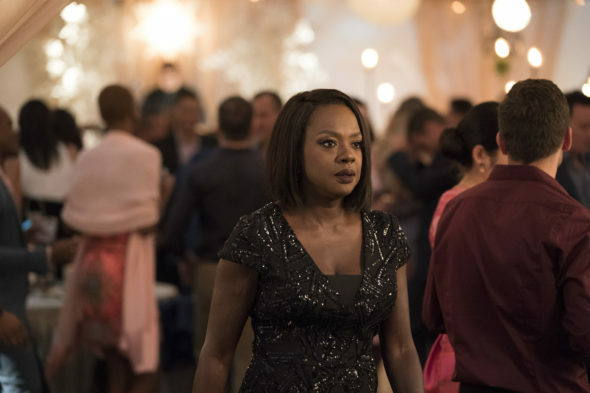 The television vulture is watching for the latest cancellation and renewal news, so this page has is the place to track the status of How to Get Away with Murder, season six. Bookmark it, or subscribe for the latest updates. Remember, the television vulture is watching your shows. Are you? An ABC legal-thriller, How to Get Away with Murder stars Viola Davis, Billy Brown, Jack Falahee, Aja Naomi King, Matt McGorry, Karla Souza, Charlie Weber, Liza Weil, and Conrad Ricamora. Amirah Vann, Rome Flynn, and Timothy Hutton have joined as series regulars in season five. The story centers on the world of Middleton University Professor Annalise Keating (Davis). Murder, deception, fear and guilt bind her to her long-time associates and students. This season, a new mystery involving one of their own will unfold, as relationships are fractured, and new secrets are exposed. The fifth season of How to Get Away with Murder averaged a 0.67 rating in the 18-49 demographic and 2.84 million viewers. Compared to season four, that’s down by 29% and 23%, respectively. Find out how How to Get Away with Murder stacks up against other ABC TV shows we’re tracking. As of April 19, 2019, How to Get Away with Murder has not been cancelled or renewed for a sixth season. Stay tuned for further updates. Will ABC cancel or renew How to Get Away with Murder for season six? The show has really dropped off over the years and Shonda is now in a new deal at Netflix, so do not be surprised if the end is sooner, rather than later. Since that’s just speculation, I’ll keep a hungry eye out and will update this page as things change. Subscribe for free updates on any How to Get Away with Murder cancellation or renewal news. TV show ratings are still important. Follow How to Get Away with Murder’s weekly ups and downs. Check the rankings for current ABC TV shows. What do you think? Should the How to Get Away with Murder TV series be cancelled or renewed for a sixth season? How long do you think this ABC TV show will last? The Good Doctor on ABC: Cancelled or Renewed for Season Three? Fresh Off the Boat: Cancelled or Renewed for Season Six on ABC? Bachelor in Paradise: Cancelled or Renewed for Season Six on ABC? The Great Christmas Light Fight: Cancelled or Renewed for Season Seven by ABC?